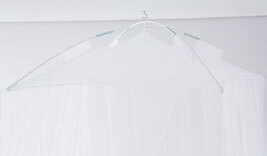 All our Mosquito Nets and Bed Canopies are easy to fit and easy to use and arrive in clear plastic packaging, together with a Mostique label, ceiling hooks and tie-backs for the box mosquito nets. 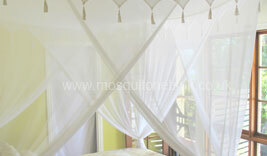 Custom designed giving you maximum quality and minimum cost on all our mosquito nets or bed canopies. Below all our products are listed giving you deeper information on how to fit your bed net and the best position to hang for maximum efficiency. Custom designed in a smart design the elegantly simple Luxurious Cotton Box Mosquito Net Super King size and the Luxurious Box Cotton Mosquito Net King size features four ample overlapping openings and fully enclosed ceiling made with seamless cotton netting fabric. Made from the best quality cotton yarn, which is pre-shrunk and has 256 holes per square inch netting. 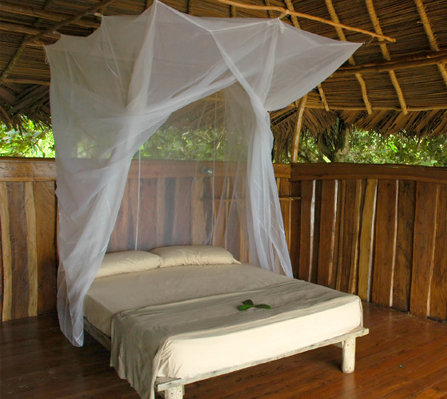 The four openings made of seamless cotton netting allow you to tie back the canopy in each corner, during the day when not in use and provides the freedom of multiple entrances The mesh size Stops mosquitoes, spiders and most insects and moths from disturbing a restful sleep, as well as allowing airflow. 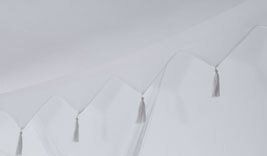 Supplied with Twelve looped top ties, (only four ties one in each corner was used in the images), the top ties that are not needed, are easily removed. For a standard flat ceiling this bed net can be either attached to a min of four ceiling hooks, (one in each corner) on a standard bed, or if you prefer to use more hooks if required. To fit over a standard bed, the size does not need to be exact, just big enough, so measure your mattress before ordering to get a good idea of size needed. For a four poster bed frame this canopy can be placed over only a flat top square of the four poster bed frame, the net Does need to be the same size as the frame as it will not hang correctly, so please measure before ordering, in the video the net is a King size over a King size bed. Also included are four tie backs, and four ceiling hooks. 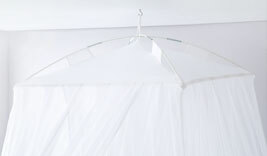 Mostiques Luxurious cotton box canopies are all fully functional mosquito nets easy to fit, fully enclosed roof with no seams or joins with fully seamed outer fabric. Our cotton nets have excellent breathability and ample overlap on the four openings to ensure it closes fully and the side panels also are made from seamless cotton netting with no joins in the netting. Each cotton net has an average weight of 1.7kg each and size in packaging is the same as a folded bath towel. Designed to hang from a standard ceiling height of 8 Feet or 244cm. Designed to fit the bed sizes listed below and extra fabric has been added to the overall size to allow for most bed base frames and easy fitting. *Please measure your bed size before ordering as well as a four poster frame. 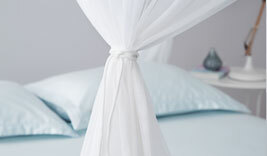 To fit the cotton box mosquito nets over a standard bed using the ceiling hooks: use the first corner above the headboard/pillow end to fit the ceiling hook, then attach the net and pull across to get the best position for the second hook, the same for hook 3 and 4. 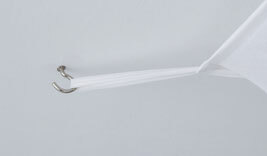 If you prefer to use more of the top ties there are a total of twelve, these can be easily removed if not required. The net will need to be hung square in order for the openings to hang correctly. Exclusive to Mostique eye catching and designed for efficiency and ease of use. So easy to fit shields you from mosquitos, spiders and other insects. Available in two sizes only the Decorative Cotton Box Mosquito Net Super King size and the Decorative Box Cotton Mosquito Net King size features four ample overlapping openings with fully enclosed cotton netting ceiling all made with seamless cotton netting fabric. 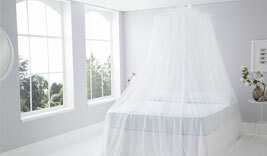 Featured in the video with a king size bed and king size cotton mosquito decorative top style net. Decorative Top Cotton Box Mosquito Nets are made from custom manufactured superior quality 100% knitted cotton netting and made from the best quality cotton yarn, which is pre-shrunk and has 256 holes per square inch. The cotton box net has four overlapping openings with a generous overlap to ensure the net closes properly. The four openings allow you to tie back the bed canopy in each corner of the bed during the day when not in use, and rope ties are included. The finer mesh size allows airflow and prevents mosquito bites as well as keeping spiders and insects away from you whilst you sleep. Supplied with twelve top ties, and can be either attached to a min of four ceiling hooks, (one in each corner) on a standard bed, hang using more hooks if required. Easily cut of the top ties you don’t require in needed. For a four poster bed frame this canopy can be placed over a flat top frame or flat top four poster bed frame, the net need to hang square in order for the entrances to overlap correctly. Custom Designed to fit the bed sizes listed below and extra cotton netting has been added to the overall size to allow for most bed base frames and easy fitting. *Please measure your bed size before ordering as well as a four poster frame. Width is 198 cm = 1.98 m - 6′6″ or 78 inches. Width is 168 cm = 1.68 m = 5′6″ or 66.2 inches. Also included are four tie backs all Mostiques cotton box canopies are all fully functional mosquito nets, with a fully enclosed roof, fully seamed, and have excellent breathability. They each have an average weight of 1.7kg each and are the size of a folded towel in the packaging. To fit the cotton box mosquito nets over a standard bed using the ceiling hooks: use the first corner above the headboard/pillow end to fit the ceiling hook, then attach the net and pull across to get the best position for the second hook, the same for hook 3 and 4 if you prefer to use more hooks the canopy has a total of twelve top ties. It is medium too lightweight. 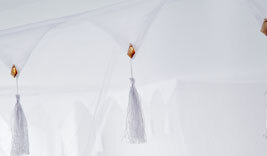 The Cotton Resort Mosquito Net is a smartly designed and versatile so you can hang from any type of ceiling as you only need one hook to hang which is provided. Hang the cotton resort net from any height ceiling as you can add length to the top tie to get the correct hanging height. Good choice for the modern clean look for the bedroom, and is designed to fit all bed sizes including Super King King and Double beds. Also can be easily dismantled and taken on your holidays or travels, and is hard wearing and durable. The Cotton Resort Style Mosquito Net measures 1250cm width and is 250cm in length, the top is 70cm x 70cm, ensuring plenty of space for sleeping comfortably. Fits Super Super King – Super King & Double Beds available in white, and has one overlapping opening with a sewn hem Each canopy will arrive with the hardware to install and hang straightaway. which includes two fiberglass top tent rods and one ceiling hook and all the cotton resort nets are fully seamed on the edge of the netting. Also can be attached to the base of a ceiling fan if required. To position the ceiling hook to hang the cotton resort net we recommend to place the hook about one third of the way down centre from the headboard. To assemble the resort style cotton net with ease firstly remove tent rods from the packaging and slot them together then give them a slight bend to get them flexible and warmed up then undo the rods in order to fit into the top of the canopy. For easy assemble before slotting the rods together firstly thread each tent rod through the top loops of the net, including the centre loop then slot the rods together. Bend the rods upwards to fit in the four corner pockets and this will ensure the canopy is stretched to give you plenty of room underneath (70cm x 70cm) *and remember to bend and flex the rods rather than pulling on the net and pushing on the corner pockets. Attach some ribbon, clear line or tie of your choice to the Centre loop if you need to hang a different height if not use the centre loop to hang the net. 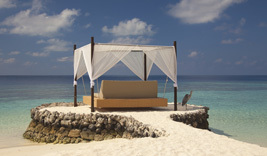 Either way this will allow the resort net to hang freely from its hook, which allows you to position you net with ease. Suitable for standard ceilings at the Height of 8 Feet or 244 cm = 2.44 m = or 96 inches. Fit each corner of the bed with a ceiling hook, starting from a corner, above the end of the headboard, and then stretch the canopy across to get an accurate position for the second hook and so forth. If you have high ceilings then it’s worth putting a light frame together, say made from bamboo canes, tie the frame into a square to the size of your bed, and hang the frame over your bed, so you can easily tie on the canopy, with the multiple top ties. With a four poster bed firstly measure the frame before ordering, and either fit by draping over a flat top frame, or tie with the top ties to the four poster bed frame. Easy to care for keep clean, just quickly soak in warm soapy water, rinse off and drip dry. Super King size Bed: W 193cm x L 214cm x H 244cm (76" x 84") Fits a 6ft x 6ft 6" bed. Double Size Bed: W 147cm x L 200cm x H 244cm (54" x 79") Fits a 4ft 6’ x 6ft 3” bed. For the Four Poster Bed Frames only, please ensure you measure the frame and work out the best way to fit and measure first. For fitting over a frame ensure the frame has a flat top and is the same size as the net. The Classic Resort Style net gives you ample room and sits nicely over Super King Beds, King beds and Double beds. Perfect for any type of ceiling as you only need on hook to hang the resort nets and if you have high ceilings no problem just add an extension to the top tie. The Classic Resort net is a Super King size net and measures 1250cm in total width (measured around the bottom) and is 250cm in length, with a 70cm x 70cm square top, which is held open using the two tent rods provided, and allows more inside space in your canopy. you can add length by extending the top tie, from the ceiling to the top of the net. The resort net is made from durable, easy-care, 100% soft polyester, white mosquito netting, with one overlapping opening, and a sewn hem. Hardware is included and arrives in PVC Bag for Packaging: + Label + Ceiling hook, so you can install straight away. The resort net is 600 grams in total weight so you can easily hang from the ceiling, or from the centre of a ceiling fan. Available in one generous size which fits all types of beds, and is popular with the guys, due to the non-fussy modern design. Also can be attached to the base of a ceiling fan due to how light this net is. When placing the ceiling hook the best position is a quarter or a third of the way down, centre from the top or the headboard/pillow end of the bed. To easily make a bamboo frame you only need to have a thin bamboo or thicker if you prefer which can be purchased from your local garden centre, bind the bamboo together in each corner with twine. Hang the bamboo frame about 10 inches or more from the ceiling using clear line, and attach to four ceiling hooks, one in each corner. Then tie the canopy onto the frame (As the top ties are loops, just cut the top of the loops to turn into a tie) the frame will then move if pulled, and help prevent damage. For a King size bed 6'0" x 6'8" (72" x 80") with a few inches added on for the crossover the bamboo lengths should be 2 x 74 inches and 2 x 82 inches. So easy to do and really looks stunning, this idea can be used with the cotton box canopy and the luxurious box nets, listed on our website. Due to them being lightweight, you be able to easily hang with stick on utensil 3M Command hooks, causing no damage to your home, especially useful if you live in rental accommodation or have a featured ceiling.